We have a significant commitment to Sustainability. This means, among other things, being a well run business that attends to an integrated triple bottom line. In the course of our business activities we will act to protect the planet, provide for people’s needs and generate a profit (which supports our growth and our staff). We also intend to use the minimum resources needed, attract and retain the best talent, study our carbon status and undertake a plan to improve it, strive for zero-to-landfill, and ensure stakeholder management. Our stakeholders include our parents, our teachers, and community members. This project has been supported and fostered by the Lane County Commission on Children and Families. The Commission coordinated early stage strategic planning with the help of Centro Latino, Lane Community College, District 4J, Headstart, the Relief Nursery, the United Way and the Lane Council of Governments. 1. Lovingly care for the planet that sustains us. 2. 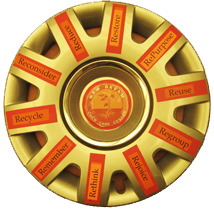 Honor natural resources by closing the loops between waste and input. 3. Minimize the environmental impact of our activities. 5. Protect our precious McKenzie water resources. 6. Focus our efforts on conservation and energy efficiency. 7. Continuously learn and teach about Food and Water. 8. Model sustainability through our commitment to relationships, continuous improvement, and striving for social justice. Before remodeling our building, we hired an architect and energy consultant, Peter Reppe from SOLARC, to assess how to reduce our carbon footprint. We implement these recommendations whenever possible. Lighting: We take full advantage of the available sunlight with large double glazed window on our southern exposure and breeze-catching clerestory windows in our big indoor play area. We use fluorescent compacts and tubes throughout the facility. Our new preschool ADA bathroom is equipped with a motion detector light switch to further save energy. Three classrooms are now heated with high efficiency infra-red heating systems. Materials: We are systematically replacing all carpet with Eco-Worx carpet tiles which are MBCD “Cradle to Cradle” Silver certified and NSF 140 Platinum certified. This means the floor covering is PVC-free, has 40% recycled content and goes back to the manufacturer when we are done with it to be recycled into more carpet. Our kitchen floor has been restored to stained and sealed concrete. 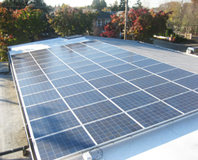 Solar: Our 8000 square foot flat roof is home to a 23 Kilowatt system of solar panels which supplies the City of Eugene with 27,400 kWh of electricity yearly. We systematically monitor our monthly energy usage and strive to identify areas of waste or over-use. Water: We have installed low-flow dual flush and child sized toilets to save water. Our laundry facility has top loading, energy efficient appliances. Our new ‘learning gardens’ have all drip irrigation systems and heavy mulch to conserve water. Air Conditioning: in 2015 we had two heat-pump systems installed on the roof that serve three areas – the front hallway, Preschool A, and the Wobbler Room. These heat pumps not only cool the rooms in the summer, but they affordably replace our aging in-wall heat systems for those areas. About a third of the building is heated by a new infra-red heat generating system. The New Dream Child Care Center implements where ever possible the practices of Re-purposing, Restoring, Re-thinking, Reducing, Reusing, and Recycling. Our art, décor, program materials, furnishings, and building materials are first sought from BRING, MECCA, and other community sources. We strive to bring less plastic and more 'real stuff' into the center for children to interact with. We are not attached to everything being ‘new’, and we acknowledge that there is no longer any ‘away’ to throw things. The entire center generates less than one trash container per week. Each room has recycling containers, and children know how to use them. Detailed instructions are posted in both Spanish and English. Our trash content is monitored to discover what can be otherwise diverted. The Center recycles double the volume of the trash container weekly. All of our soft paper products (towels and tissues) are disposed of separately and composted along with our table and kitchen scraps. This compost and the enthusiastic worm population comes back to our garden to nurture our plants. We participate in the City of Eugene’s “Love Food, Not Waste” program, so in addition to composting onsite, we also send a 60-gallon cart of food waste to be composted weekly. We first choose products and food with minimal or no packaging. We believe that these two linked issues are so important and central to our consciousness, our health, our economy, our social order and global politics that they deserve our extensive and intensive study and appreciation. From the garden to the table to the science lab and beyond, the opportunities for applied learning are rich and highly relevant. These are really the two big topics. In many parts of the world today drinking water costs more than oil and is in short supply. It is our intention to grow as much fresh organic food as possible, invite families to help, and enjoy great eating and better health for all. 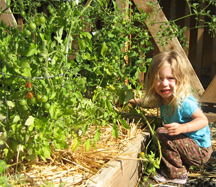 We want to keep expanding our garden areas, and opportunities to get involved with your kids abound. 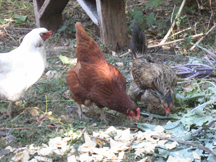 Our curriculum emphasis is to learn about all aspects of Food & Water and the myriad related topics while enjoying the healthy delicious food that we have grown ourselves. We also proudly serve and drink our delicious McKenzie River tap water and encourage everyone else to do the same.